Data presented at the recent ECTRIMS offer fresh insight and potentially new direction into the cause of multiple sclerosis. The pinnacle of the most important worldwide gathering of MS sub-specialists is the presentation of late-breaking abstracts that are embargoed until that time, which means that even the most influential MS specialist waits eagerly to learn what’s new. At 9:30am Paris time, when Dr. Hartung took to the stage for the penultimate time slot, few in the audience of several thousand doctors, scientists, and others, knew what to expect. What seemed like a fairly standard post hoc analysis of negative trial results was actually the most visible introduction to the key that may unlock the mysteries of MS.
GNbAC1 isn’t just another unnamed pharmaceutical compound, but rather the test case for a novel way of potentially understanding the actual cause of MS. Our current understanding of MS is that it is an autoimmune disease affecting the central nervous system (CNS). More than 200 genes have been associated with the risk for MS, and it is believed that an early (prepubescent) environmental factor triggers the neuro-inflammatory cascade that is characterized, in the vast majority of patients, by relapses of CNS dysfunction. Since MS was first described by Jean-Martin Charcot in the 19th century, there have been revolving theories concerning its underlying cause; the viral theory remains the most widely cited. Although everyone with MS has evidence of prior exposure to Epstein-Barr virus (EBV), based on immunoglobulin levels, and even actual viral particles identified in the meninges in some studies, the problem with the viral theory is that almost everyone in the general population has also been exposed to EBV. Thus, if a common virus truly causes MS, then why does MS only affect a small fraction—1%—of the population? Also, if there isn’t a viral cause for MS, then why does it act like a postviral neurological syndrome? The answers to these important questions lie in the insights gained by CHANGE-MS. Instead of an early childhood viral exposure triggering MS in a genetically susceptible individual, CHANGE-MS suggests the possibility that the initial viral basis of MS is actually ancient viral DNA that lies dormant within us and is roused after having been incorporated into our genome for millions of years. For the past century, instead of looking for an external cause of MS, we should have been focused inward to the 8% of foreign DNA already incorporated into our genome. These DNA elements are termed pathogenic human endogenous retroviruses (pHERVs), and the expressed pHERV-W envelope (Env) protein is thought to be pathogenic in MS; pHERV-W Env is found in active MS lesions on monocytes and microglia.2-7 It still takes an environmental exposure, such as viral infection with EBV, to de-repress the pHERV-W Env gene and allow transcription of mRNA (messenger RNA) and expression of the pHERV-W Env protein. 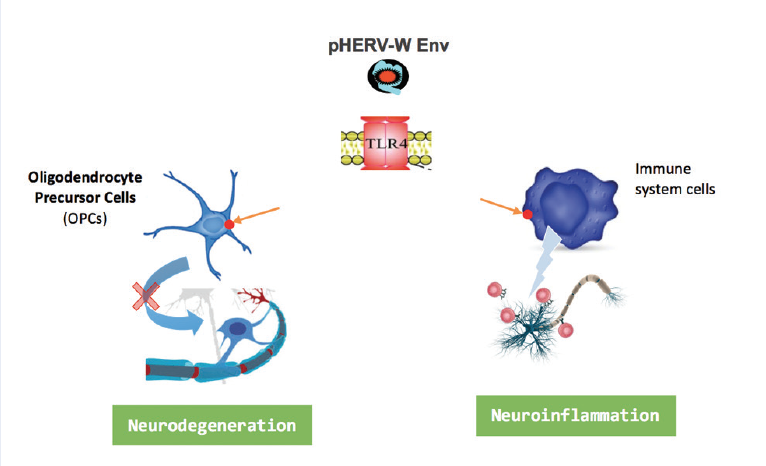 pHERV-W Env is an agonist of toll-like receptor 4 (TLR4), leading to a proinflammatory cascade and inhibition of oligodendrocyte progenitor cell (OPC) maturation through nitrosative stress.2-7 GNbAC1 is a recombinant, humanized IgG4-kappa monoclonal antibody, which binds with high affinity to pHERV-W Env, thereby blocking pHERV-W activation of TLR4 and rescuing myelin expression in OPCs. Because GNbAC1 does not seem to have other mechanisms of action, any benefit would seem to argue that the HERV hypothesis in MS has some merit, and we may be considering a whole new understanding of the underlying cause of MS. Unfortunately, the August 28, 2017 press release by the companies developing GNbAC1 (GeNeuro SA and Servier) reported that while safe and well tolerated, GNbAC1 did not reach its primary six-month endpoint of reducing cumulative brain MRI gadolinium-enhancing lesions at 12, 16, 20, and 24 weeks as compared to baseline. Dr. Hartung’s presentation explained these primary results because GNbAC1, which is not an immunosuppressant, may simply take longer to help in MS, and in the post hoc analysis of patients with active MRIs, there is a statistically significant reduction in gadolinium-enhancing lesions when comparing week 24 to baseline data.1 Additionally, there was a statistical trend favoring remyelination, evidenced by improvement on magnetization transfer ratio in the normal-appearing white matter and cerebral cortex of people with MS treated with the highest dose of GNbAC1 studied in CHANGE-MS. These promising results highlight why GNbAC1 is the most interesting MS compound to watch next year; of note, 48-week results are expected in the first few months of 2018. Image courtesy of GeNeuro SA. Figure 1. Human endogenous retrovirus type W envelope protein. Since the FDA approval of the first disease-modifying therapy for MS in 1993, there has been an explosion of new approved therapies, with a current count of 13 separate branded products, one branded generic, and two unbranded generic disease-modifying therapies (with one to two new ones expected yearly for the next several years). The HERV hypothesis in MS is leading the way for other pHERV subclasses in other neurologic and autoimmune diseases. For example, there is ongoing interest and research into pHERV-K in amyotrophic lateral sclerosis and an enrolling Phase 2 trial of GNbAC1 in type 1 diabetes mellitus. The fate of our understanding of currently incurable neurologic and nonneurologic diseases lies in the results of GNbAC1 in MS. We have a lot to be excited for in 2018. Daniel Kantor, MD is Director of Neurology at Florida Atlantic University in Boca Raton, FL, and the Founding President of the Medical Partnership 4 MS (MP4MS). 1. Hartung HP, Curtin F, Schneble HM, et al. Review of week-24 Results. GNC-003: an international, double-blind, randomized, placebo-controlled phase IIb trial to assess the efficacy, safety and pharmacokinetics of GNBAC1 in patients with relapsing remitting multiple sclerosis. ECTRIMS-ACTRIMS 2017: Paris, Oct 2017. 2. Dolei A, Uleri E, Ibba G, et al. The aliens inside human DNA: HERV-W/MSRV/syncytin-1 endogenous retroviruses and neurodegeneration. J Infect Dev Ctries. 2015;9(6):577-587. 3. Kremer D, Schichel T, Forster M, et al. Human endogenous retrovirus type W envelope protein inhibits oligodendroglial precursor cell differentiation. Ann Neurol. 2013;74(5). 4. Rolland A, Jouvin-Marche E, Viret C, et al. The envelope protein of a human endogenous retrovirus-W family activates innate immunity through CD14/TLR4 and promotes Th1-like responses. J. Immunol. 2006;176(12),7636-7644. 5. Mameli G, Poddighe L, Mei A, et al. Expression and activation by Epstein Barr virus of human endogenous retroviruses-W in blood cells and astrocytes: inference for multiple sclerosis. PLoS One. 2012.7(9), e44991. 6. Kremer D, Forster M, Schichel T, et al. The neutralizing antibody GNbAC1 abrogates HERV-W envelope protein-mediated oligodendroglial maturation blockade. Mult Scler. 2015 Aug;21(9). 7. Li W, Lee MH, Henderson L, et al. Human endogenous retrovirus-K contributes to motor neuron disease. Sci. Transl. Med. 2015.;7(307),307ra153. 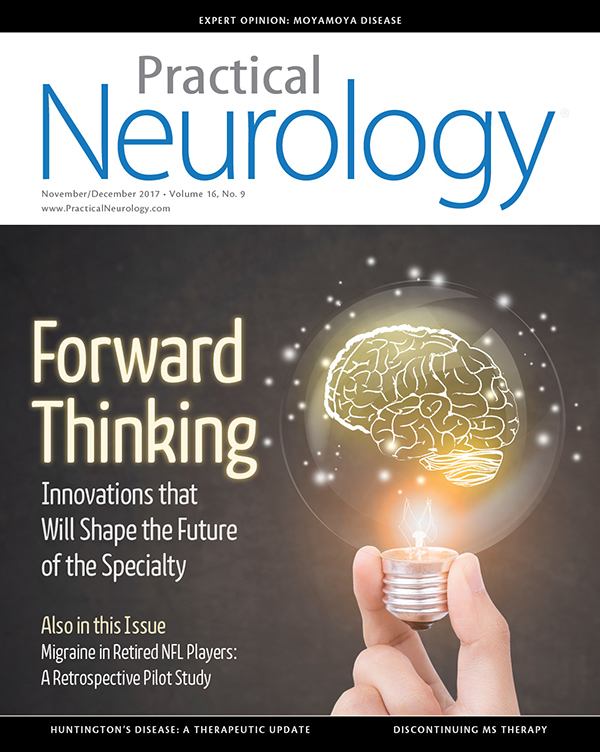 Findings suggest that retired NFL players may be at increased risk for migraine, depression, anxiety, chronic pain, bedwetting, essential tremor, and Parkinson’s disease. Distinguishing between definite MMD, probable MMD, and MMS may not have significant practical implications. An expanding research and therapeutic landscape has increased awareness and treatment of Huntington’s disease.